:Finally, there is new hope for those who suffer from depression. For decades, standard treatment for depression hasn't changed. Sufferers typically are prescribed antidepressant medication and talk therapy. Period. But at least 30 percent of depression sufferers aren't helped by standard treatment. Instead, they are left still searching for true and lasting relief. In Healing Depression for Life, Dr. Gregory Jantz offers a new way forward. Drawing on the innovative whole-person approach that has made his treatment center one of the top 10 depression treatment facilities in the US, Dr. Jantz reveals the treatments, practices, and lifestyle changes that can provide lasting relief from depression-by addressing its chemical, emotional, physical, intellectual, relational, and spiritual causes. Not all depression is the same, and not all people with depression are the same. Healing Depression for Life will help you find the missing puzzle pieces that could make all the difference in overcoming your feelings of helplessness and hopelessness and put you on the path to lasting joy. 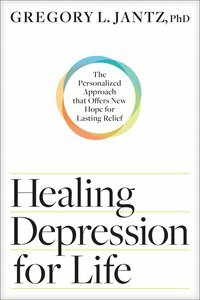 About "Healing Depression For Life: The Personalized Approach That Offers New Hope For Lasting Relief"